The Treasure Coast Builders Association is a professional association of over 400 member firms representing over 4,350 individuals. 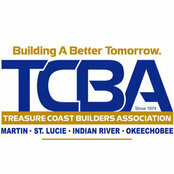 TCBA represents and protects the interests of the building industry in Florida's Martin, St. Lucie, Indian River and Okeechobee Counties. The Treasure Coast Builders Association is dedicated to serving its members by: Providing leadership in the building industry; Creating a unified front to achieve greater integrity and competency; Promoting a better business industry for the community. The Treasure Coast Builders Association is dedicated to Building a Better Tomorrow by serving its members and the community through leadership, advocacy and education.